What does it mean when the NYSE TICK hits a very low value during the trading day? I went back to March, 2003 and investigated all instances in which the TICK hit a value of -1000 or less. This occurred 108 times out of 775 trading sessions. One day later, the average price change in SPY was .15% (64 up, 44 down), stronger than the average daily price change of .06% (432 up, 343 down) for the sample overall. It thus appears that a day of strong selling pressure results in favorable expectations the next day. I took the analysis one step further, however. I broke down the strong selling pressure days into those in which the absolute value of the high TICK for the day was lower than the absolute value of the low TICK (N = 52) vs. those in which the absolute value of the high TICK for the day was higher than the absolute value of the low TICK (N = 56). Thus, we're looking at high selling pressure days with low buying pressure vs. high selling pressure days with high buying pressure. One day after the high selling/low buying days, the average change in SPY was only .01% (27 up, 25 down)--weaker than the overall market average gain. One day after the high selling/high buying days, the average gain in SPY was an impressive .29% (37 up, 19 down)--much stronger than average. It thus appears that strong selling pressure without countervailing buying interest tends to carry over the next day, creating subnormal returns. Strong selling pressure matched by strong buying interest creates superior returns. Here is the Trading Markets article with new observations on life and markets. A reader astutely pointed out that it is talent *and* preparation that joins with opportunity to create success. Indeed. As I'm writing, interest rates on the 10 year are dropping, the dollar is weakening vs. the Euro, and stocks are bouncing higher. Even on a short-term basis, these relationships are worth watching--particularly when the different markets are in sync and telling the same story. In the last four trading sessions, interest rates on the 10-year note ($TNX) have risen by about 3.85%, while financial stocks ($BKX) have been down -1.65%. What happens after we have such rising rates and weakening financial issues? I went back to January, 2003 (N = 813) and found 99 occasions in which interest rates had risen by 3% or more in a four-day period. Four days later, interest rates rose on average another .58% (55 up, 44 down). When interest rates were up by 3% and $BKX was down more than 1% over the four-day period (N = 25), rates rose over the next four days by an average .71% (16 up, 9 down). Interestingly, this pattern appears to have changed over the course of the lookback period. When I examined the most recent data in which interest rates were up and $BKX was down (N = 13), the next four-day rise in rates was only .12%, but the next four day change in SPY was down -.20% (6 up, 7 down). This is weaker than the average four-day gain in SPY of .18% (457 up, 356 down). When I looked at the data in 2003 and early 2004 (N = 12), the next four-day rise in rates was 1.36%, but the average four-day change in SPY was .42% (7 up, 5 down). Early in the bull market, rate rises led to greater rate rises, but also led to stock strength. More recently, rate rises have not led to greater rate rises, but have led to stock underperformance in the near term. Whereas stocks held their ground during interest rate rises early in the bull market, they now display subnormal returns. That appears to be particularly the case among financial and large cap issues. Note: When I returned from vacation, I found that this article, written about two years ago, had been downloaded over 60,000 times in three days. Such are the viral ways of the Web. A followup reflections article will appear on the Trading Markets site tomorrow. I've never seen a trader succeed whose explicit or implicit goal was to not lose. The trader who trades to not lose is like the person who lives to avoid death: both become spiritual hypochondriacs. No union was ever destroyed by a failure of romance. It is the loss of respect, not love, which ends a relationship. Love, once present, never dies. It must be killed. Sometimes we select markets--and trading styles--much as we choose romantic partners: by their ability to validate our deepest-held images of ourselves. Our choices generally succeed, for better or for worse. Many a trader fears boredom more than loss, thereby experiencing the two in sequence. Goodness of character is measured in loyalty to others; greatness of character is measured in loyalty to principle. A measure of the soul: the degree to which the surpassing achievements of others evoke inspiration rather than envy. If you listen to the words, you'll understand the brains of the speaker. If you listen to the tone, you'll understand his heart. Show me what a man loathes, and I will show you what he cannot accept in himself. Two traders: one increases size after a loss; the other gets smaller. Both continue to lose. One encounters losing traders as often as one encounters losing golfers--and for much the same reason. The absence of self-acceptance too often masquerades as the desire for self-improvement. Regular updates on the Trading Psychology Weblog will resume Thursday evening; also on Thursday, the historical pattern analyses will resume here on the TraderFeed site. Wednesday's market was strong out of the gate, with NASDAQ and small cap issues leading the way. There was very solid buying across the market, as we vaulted to the highs of the recent range in the S&P, but went to new recent highs in the broad indices. This places us in a short term uptrending mode. Even in the face of higher interest rates, it appears that selloffs are bringing in buyers. Demand expanded greatly to 122; Supply was 41. New 20 and 65 day highs expanded to 1308 and 787; new 20 and 65 day lows were 610 and 254. Normally such upside momentum as we're seeing in the Demand/Supply numbers carries over in the short-term. First interest rates moved higher on strong economic news, then stocks sold off in response to Fed tightening. The result is that we moved well below the recent multiday range, setting off a short-term downtrend. It was a good example of a dynamic discussed recently, in which moves in the stocks are most likely to trend when we see significant movements in energy, interest rates, and or currencies. New 20 and 65 day lows expanded to 618 and 234; Supply exceed Demand by 101 to 48. As long as we continue to make day over day lows and expand new lows and Supply, selling bounces below the day's average price is the operative mode. I'll be returning to regular blog posts and updates on the Trading Psychology Weblog on Thursday. Monday's market continued the narrow action in the S&P 500, continuing the neutral trend. It was a great illustration of the kind of day I referenced in the recent post about mean reversion. Knowing the day's average price and seeing: a) an open near the average price; and b) low volatility from the prior session; and c) modest early volume allowed traders to lean on the market's tendency to revert to that average price. Here is the Trading Markets article on that topic. I notice that we had an expansion of new 20 and 65 day highs, but also an expansion of lows. Demand was 59; Supply was 69, which means we had slightly more stocks showing negative momentum than positive--but the majority not showing any distinct momentum. We need to see a move out of the recent several day range accompanied by an expansion of new highs/lows to establish a directional trend. Mean Reversion: How Often Does It Occur? Recent posts have looked at the market's lack of trending and, indeed, its tendency to reverse moves. Does this suggest that the market tends to revert to mean trading prices? If so, might we find tradable strategies from this tendency? I went back to March, 2003 (N = 773) and investigated each day of performance in the Dow Jones Industrial Average (DIA). I computed the previous day's average price simply as the average of the open-high-low-close. I then looked to see how often this average price was touched during the following day's trade. It turns out that we revert to this mean trading price approximately 63% of the time. Since February of this year, that proportion has risen to over 70%. Are there variables that predict an even greater occurrence of this reversion? Do we see different levels of reversion on different time frames? Lots of good research questions here. Stay tuned. My recent Trading Markets article, along with recent blog entries here, found evidence of countertrend equivalence on a 5 day basis and, to a more modest degree, over a 5 hour timeframe. Recall that the idea of countertrend equivalence is that, if the market establishes a strong trend over X period, the next X period will tend to reverse this trend. I decided to extend the analysis by looking at 5 week periods in SPY. Since March, 2003 (N = 155) we have had 27 strong uptrending periods on my trend measure. Five weeks later, SPY averaged a gain of .67% (16 up, 11 down), weaker than the average five-week gain of 1.36% (103 up, 52 down). To create a relative match, I looked at the 25 strongest downtrending periods in SPY during that same time. Five weeks later, SPY averaged a gain of 2.36% (18 up, 7 down)--much stronger than normal. Once again, we see evidence of countertrending, with moves over one period reversed in the next. The effect is especially strong for reversals of downtrends on a five day and five week basis, suggesting that these timeframes might be worth coordinating for intermediate-term trades. One of the interesting aspects of writing my current book on trader performance is interviewing people who have long years of experience as traders and as mentors to traders. To a person, they emphasize that success in trading is not a function of finding better indicators or trading patterns. Rather, they emphasize the seemingly mundane aspects of trading mechanics: sticking to trading plans, managing risk, and adapting to changing market conditions. While the historical patterns on this site are useful food for thought and a worthwhile starting point for framing market understandings--and trade ideas, they cannot substitute for the fundamentals emphasized by these mentors. Of these, risk management is perhaps the most important. Victor Niederhoffer, in his excellent book The Education of a Speculator, uses the example of trying to make $10.00 from $1.00 when you have a 60/40 chance of winning a dollar from each individual bet. The odds of ruin in such a game are about 66%. Indeed, one would need a bankroll in excess of $4.00 to make the pursuit of $10.00 a worthwhile game--even with 60/40 odds. The moral of the story is that good odds aren't enough. Proper position sizing--and a bankroll sufficient to weather the inevitable strings of losses that occur with chance--are all-important. I have seen more psychological problems created by poor money management than the reverse. Losses should not be traumatic--emotionally or financially--if they are built into the trading plan and kept to a very reasonable fixed fraction of portfolio size. My last post introduced the idea of countertrend equivalence: Once we get a solid trend reading for a period of time X, the next period X tends to reverse this trend. We saw that this occurred over a five-day period: if we have a strong trend over five days in SPY, the next five days tend to run counter to this trend. I took a look at hourly SPY data going back to 11/21/05 (N = 586). When we've had a strong uptrend over a five hour period (N = 75), the next five hours in SPY average a loss of -.08% (33 up, 42 down). That is weaker than the average five-hour gain of .04% (312 up, 274 down) for the general sample. When we've had a strong downtrend over a five-hour period (N = 47), the next five hours in SPY have averaged a gain of .18% (29 up, 18 down). This is noticeably stronger than the sample overall. Once again, we see evidence of countertrend equivalence. I will pursue this topic further in my upcoming Trading Markets article. I'm following up on the broad market's countertrend tendencies. When my trend measure registers that the market is trending over X time periods, it appears that the next X periods tend to reverse this trend. I need to research this further but, if true, this countertrend equivalence could be a solid basis for combining time frames in analysis. In other words, let's say you had a strong downtrend reading on an intraday basis *and* on a multiday basis. That should provide an excellent signal for a longer-term market purchase. I went back to March, 2003 (N = 766) and examined five-day trend readings in SPY and then what happened in the *next* five days of SPY trading. When SPY displayed a strong five-day downtrend (N = 104), the next five days in SPY averaged a gain of .80% (68 up, 36 down). That is much stronger than the average five-day gain of .31% (448 up, 318 down) for the overall sample. When SPY displayed a strong five-day uptrend (N = 196), the next five days in SPY averaged a gain of .17% (108 up, 88 down), weaker than the average five-day gain for the broad sample. In short, five day trends are tending to reverse. The next question is: can we pair these five day periods with other time frames to create superior timing of trades? Just wanted to outline a direction my research will be taking, integrating the theme from the last post (looking at multiple time frames) and the recent theme of market trending. I'll be working on creating trending measures of the markets on two different time frames and then will see if combining short- and longer-term trend measures helps us identify historical patterns. If so, that would be significant, because the trend measures will be ones that could be applied to any stocks or markets. A second direction is identifying sectors that commonly lead the broad market and comparing their trend measures with that of the broad market. My hypothesis is that a "crossover", in which the trend of the leading market overtakes the broad market trend, might provide an entry signal for short-term trend followers. What's Happening on the Larger Time Frame: Does It Matter? A reader recently made the valuable point that, in addition to looking at such key aspects of the market as volatility, momentum, trend, and sentiment, it is necessary to look across different time frames. That raises an interesting question: Do time frames matter? If we see a historical pattern on one time frame, does what's happening on the larger time frame make a difference? To address this issue, I looked at yesterday's market, in which SPY was down -.63%. Going back to March, 2003 (N = 765), I found 95 occurrences in which SPY was down between half a percent and a full percent. The next two days in SPY averaged a gain of .20% (55 up, 40 down), stronger than the average two-day gain in the SPY sample of .12%. I then divided the same down day sample of SPY into two categories based on time frame performance. One group was down between half and a full percent and was making a five-day closing low (just like yesterday; N = 46). The other group was down by the same amount but not making a five-day closing low (N = 49). When the down day in SPY was making a five-day low, the next two days in SPY averaged a gain of .40% (29 up, 17 down). When the down day in SPY was not making a five-day low, the next two days in SPY averaged a flat performance (26 up, 23 down). Thus, the bullish implications of a down SPY day are entirely attributable to the fact that they're five-day lows. The larger time frame matters quite a bit. This is a moderately bullish consideration for today, especially if early action fails to take the averages below yesterday's lows. Hats off to the reader for an excellent observation. The Power Measure: What Happens Once a Trend Emerges? Yesterday's entry on the Trading Psychology Weblog dusted off a proprietary indicator I developed a while ago, which I dubbed the Power Measure. It was my very first effort to measure a variable I call "trendiness": the market's tendency to persist in directional movement. After writing the recent articles that tracked the decreasing trendiness of the stock indices, I decided to modify the Power Measure and utilize it as an operational measure of trending that could be applied to a variety of markets and time frames. The nice thing about the measure is that it creates a normalized measurement, in which perfect upward trending earns a score of +100 and perfect downward trending earns a score of -100. Scores near zero suggest absence of trending: a tendency for price movement in period one to reverse in period two. Note that the Power Measure is a pure measure of price persistence; it does not confuse momentum/price strength with trending. I went back to March, 2003 (N = 759) and looked at future price movement in SPY as a function of the Power Measure reading. When the measure was 90 or greater (consistent upside trending; N = 85), the next three days in SPY averaged a loss of -.02% (43 up, 42 down)--much weaker than the average three-day gain of .18% for the sample overall (443 up, 316 down). When the Power Measure was -80 or lower (consistent downside trending; N = 55), the next three days in SPY averaged a gain of .53% (39 up, 16 down)--much stronger than average. This is the clearest cut evidence I've yet seen of a countertrend bias to the market. Waiting for a distinct trend to emerge and then fading it has proven far more successful as a trading strategy than trying to ride trends. It will be interesting to see if this holds for shorter time frames as well. If my future investigations prove equally promising, I'll bring the Power Measure back to the Weblog. My recent Trading Markets article took a look at how small cap performance acts as a mediator of past and future S&P performance, creating a statistical interaction effect. Today we had an interesting situation in which the S&P Midcaps ($MID) underperformed the S&P Small Caps ($SML). Specifically, SML was up .03% and MID was down -.34%. Going back to March, 2003 (N = 766), I found 127 occasions in which the day's change in SML was within plus or minus .20%. The next day in SPY averaged .01% (63 up, 64 down), which is weaker than next day results for the sample overall. Once again, however, we see an interaction effect. When SML is neutral and MID is strong, the next day in SPY averages a loss of -.11 (29 up, 35 down). When SML is neutral and MID is weak, the next day in SPY averages a gain of .13% (34 up, 29 down). Once again we see that a critical mediating effect is played by the relative outperformance or underperformance of the small cap stocks. When SML is neutral but outperforms MID, next day results in SPY are more favorable than when SML is neutral but underperforms MID. Score this as a mild bullish consideration for tomorrow. Large Caps Strong, Small Caps Stronger: What Next? We've had a strong six-day run in the large cap stocks, with XMI up over 2.5% in that period. Small cap issues (SML) have been even stronger, up about 4%. I decided to look at what happens in the S&P 500 (SPY) since March, 2003 (N = 762) after a big cap run and whether small caps play a role in future performance. I found 94 occasions of six-day XMI gains of over 2%. Six days later, SPY was up by an average of .17% (55 up, 39 down), which is less than the average six-day gain for the sample of .37% (449 up, 313 down). When XMI was up by more than 2% in six days and SML was strong (N = 47), the next six days in SPY averaged .50% (31 up, 16 down). When XMI was similarly up and SML was weak (N = 47), the next six days in SPY averaged a loss of -.16% (24 up, 23 down). Once again, it appears that performance in the small caps mediates future performance in the S&P 500--this time on a longer time frame. When the large caps are strong and small stocks are relatively weak, the S&P noticeably underperforms over the next six days. When the large caps are strong and small stocks are also strong, there are greater odds of continuation of strength. We'd have to chalk this one up as moderately favorable for the bulls. Here's a look at a relatively pure measure of large cap performance, the Major Market Index ($XMI), vs. a relatively pure measure of small cap performance, the S&P 600 ($SML). On Friday, we barely moved on XMI, registering a loss of -.07%. SML was stronger, rising .26%. I decided to go back to March, 2003 (N = 765) and see how next day performance in the S&P 500 was impacted by previous relative performance in SML vs. XMI. I found 192 occasions in which XMI closed with a gain of less than .20% and a loss not greater than -.20%. The average next day performance in SPY was .07% (107 up, 85 down). On narrow XMI days in which SML was strong (N = 96), the average next day gain was .10% (58 up, 38 down). On narrow XMI days in which SML was weak, the average next day gain was only .04% (49 up, 47 down). This is a pattern I have noticed before: smaller cap performance appears to lead that in larger caps. As long as SML outperforms XMI, short-term returns tend to be more favorable than when SML underperforms. I'll be taking further looks at these sectors in the near future. Closing NYSE TICK: Does It Matter? Here is the Trading Markets article on Euro currency trading; thanks for the interesting comments. I decided to take a look at the closing level of the NYSE TICK and whether it has any relevance for the next day's trading. Friday we closed above +900 on the TICK, suggesting broad buying on the close. Indeed, the final TICK number might be viewed as the leaning of traders' market-on-close positions, as they either lift offers or hit bids in stocks. My first observation, going back to March, 2003 (N = 767), is that there is a positive bias to the data. The average closing TICK value is 452. When the TICK closes above 900 (N = 82), the next day in the S&P 500 (SPY) averages a gain of .11% (48 up, 34 down). This is stronger than the average gain for the sample of .06% (429 up, 339 down). When the TICK closes below -200 (N = 43), the next day in the S&P 500 averages a gain of .26% (28 up, 15 down). It thus appears that selling on the close tends to reverse the following day, while strong buying on the close has a moderate tendency to continue the next day. Combining the closing TICK with momentum measures, such as the Demand/Supply Index, might screen for particularly positive times to buy the market. Another idea would be to track the TICK readings from the final hour of trade and the impact the next day. 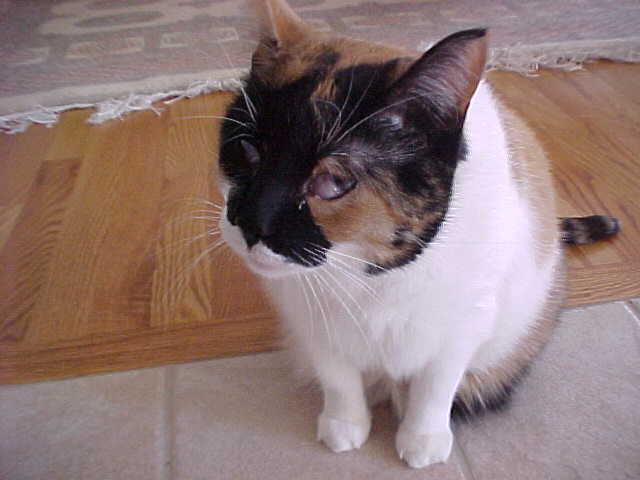 PS - Above is Mali, the blind cat we adopted in Syracuse. When we moved to Naperville to a three story house, Mali took a day and a half to find her way around completely. That was before we got our furniture in. She adapted to the furniture in a day. She constantly sniffs as she moves, and her hearing is excellent. She comes running whenever she hears someone visiting us--she loves meeting new people. How many of our senses do we engage in trading, and how much information processing do we lose by being solely dependent upon sight? Forex: Know the Market You're Trading! My recent article in Trading Markets emphasized the importance of the fit between the personality of a market--its degree of volatility and trending--and the trading style of the trader. Quite a few readers wrote to me, asking about which market would be best for them. Many asked specifically about currency (forex) trading, since instruments such as the Euro are known to be trending and volatile. My next article for Trading Markets will examine whether the Euro truly is a superior trading instrument. I think you'll be surprised by the findings. Without giving away too many punch lines here, allow me to mention one important finding: I find no evidence of trending in the currency market on either a 30 minute or daily basis. In fact, up periods are modestly more likely to be followed by down periods (and vice versa) than by continuation. Many brokerage houses specializing in currency trading--especially those going after retail customers--stress what wonderful trending markets currencies are. They also emphasize commission-free trading with "only" a three-pip spread and possible leverage of several hundred to one on your money. Well, each pip in the Euro emini is like a tick in the S&P emini: worth $12.50. So the highly leveraged trader in a market he thinks is trending, buys a volatile period and what happens? He is down three ticks on size already even if he scratches the trade. But when the market reverses with high volatility, he quickly is in the red by a substantial amount. I spoke with a very well placed industry insider who revealed to me that the average length of time from the opening of a trading account to the closing of that account was seven months. This was not because the trader was dissatisfied with the firm; rather, that was how long it took the average customer to blow through their capital. Yale Hirsch says, "Investigate before you invest." That's wisdom that applies equally to traders. First off, I want to thank readers who have suggested ideas for research and who have provided helpful feedback re: this and the Trading Psychology sites. Thanks also to readers who have shown interest in The Psychology of Trading; for it to have cracked the top 10,000 on Amazon three years after its publication is a testament to the enduring relevance of psychology for trading. My new book, Enhancing Trader Performance, is undergoing editing and should be published this fall. A reader very helpfully pointed out that strong gains accompanied by low TRIN readings are bullish on a next day basis. Recall that my analysis yesterday showed weakness over the intermediate term. Fortunately today provided an opportunity to test the reader's idea: We have closed higher by 2.56% on the NASDAQ 100 ETF (QQQQ) over the past two days. The NASDAQ TRIN during that time has averaged .496. Going back to March, 2003 (N = 762), I found 81 instances of a two-day rise of more than 2% in QQQQ. Over the next two days, QQQQ was higher by an average .26% (50 up, 31 down), stronger than the average two-day rise of .15% (413 up, 349 down) for the broad sample. When, however, QQQQ was up by more than 2% on a two-day basis and the TRIN averaged less than .50 over that same time (N = 20), the next two days were up by an average of .54% (13 up, 7 down). Score one for short-term bulls and for an astute reader. The S&P 500 (SPY) has approximately 2.2% in the past 3 days on an average TRIN reading of .69. I went back to March, 2003 (N = 759) and found 51 occasions in which we had a three-day period with a rise of more than 2%. The average three-day TRIN for those occasions was .80, indicating that we have had an above average concentration of volume in rising issues. Six days following the three-day rise, SPY has averaged a gain of .70% (35 up, 16 down), much stronger than the three-day average gain for the overall sample of .36% (446 up, 313 down). When we break the strong occasions in half based on three-day TRIN readings, however, a distinct pattern appears. When SPY is strong and the TRIN is lower than average (higher concentration of volume in rising issues), the next six days average a gain of only .03% (13 up, 12 down). When SPY is strong and the TRIN is higher than average, the next six days average a gain of 1.35% (22 up, 4 down). Once again we can understand the results in terms of market efficiency. When it takes a greater concentration of volume in rising issues to achieve a particular rise, the market is less efficient and subsequently produces subnormal returns. When the market is more efficient--able to generate a given rise without a commensurate concentration in volume--returns following strength tend to continue the strength. The results suggest that it may be difficult to generate the upside followthrough normally associated with a strong three-day gain. This will kick off a historical look at the TRIN (Arms Index). Today we had a gain of .19% in SPY and TRIN was .75. I went back to March, 2003 (N = 761) and looked at all one-day occasions in which TRIN was between .70 and .80 (N = 87). What we find by making TRIN the independent variable is that such a TRIN value can be associated with very different market outcomes. For example, in the sample, the one-day SPY readings associated with TRIN between .70 and .80 range from a loss of -.15% to a gain of 2.13%. The gain of .19% on Monday was definitely on the lower end of the spectrum. It's saying that, although volume was relatively concentrated in advancing stocks, such concentration could not generate much upside in the large cap market. I divided the sample in half based on the SPY outcomes to see what happened the next day. When TRIN was between .70 and .80 and SPY was weak, the next day in SPY averaged a gain of .01% (21 up, 22 down). This was weaker than the average rise of .06% for the full sample. When TRIN was in the same range and SPY was strong, the next day in SPY averaged a gain of .08% (25 up, 19 down). It thus appears that when the market is relatively inefficient--a concentration of volume cannot generate much price gain--short run outcomes are weaker than if we see volume concentration associated with price strength. I'll be investigating this idea of market efficiency further. For now, we'll count this one very modestly in the bear's column. Here is a weekly view of the issue of trending markets using S&P 500 and NASDAQ 100 data. (By the way, a different perspective is posted to the Trader Performance page on my personal site). I went back to January, 1997 (N = 479) and just looked at weekly closing prices. Once again, I focused on occasions in which either a rise was followed by a rise or a decline by a decline. In all, for the S&P, there were 239 occasions in which we saw a two-week trend and 240 occasions in which rises were followed by declines or vice versa. This is exactly what we'd expect by chance. In the NASDAQ, we had 246 trending occasions and 233 non-trending two-week instances. (Interestingly, the NASDAQ also showed up on my Trader Performance analysis as performing better vis a vis momentum/trend trading). Looking only at 2005/6 data (N = 62), we had 31 trending two-week periods in the S&P and 31 non-trending ones. In the NASDAQ, we had 33 trending periods and 29 non-trending ones. Interestingly, we see neither evidence of persistence (trending) or anti-persistence (reversal) in the weekly data--even the most recent weekly readings. What this says to me is that the market's loss of trendiness is occurring more at shorter time frames than at longer ones. My next Trading Markets article will address this. Will Very Short-Term Momentum Trading of the S&P Work? As we've seen from the recent Trading Markets article and yesterday's blog posting, the S&P 500 Index has been losing its trending properties across multiple timeframes, from daily through intraday. Anecdotal evidence suggests that scalpers are suffering in this market, as well. Let's see how the market is trending on their time frame. Please note that when I talk about scalpers, I am referring to liquidity providers in the electronic marketplace. These are participants who are in the market most of the time, working bids and offers and attempting to extract small, frequent profits from very short-term movement. I went back to January, 2004 and looked at all five-minute periods in the ES contract (N = 44,110). As before, I calculated all instances in which the market was either up following a five-minute rise or down following a five-minute decline. What we see is that only 14,362 of the periods displayed such two-period trends. This proportion is *much* worse than what we saw in the daily or even the hourly data. In essence, it's saying that the odds of the market rising five minutes after a five minute rise (or declining after a five-minute decline) are worse than one in three. The reason for this is that a number of five-minute periods close unchanged. The low volatility conspires to restrain very short-term trending behavior. This makes momentum trading near impossible. Either one must extend one's holding period well beyond five minutes--in which case you're really no longer a scalper--or one be willing to fade any movement whatsoever, risking those one in three occasions when the market can run you over. Is there any hope for momentum and trend traders in different instruments? This will be the upcoming focus. Does The Market Trend on an Intraday Basis? I'm getting quite a few positive comments on my recent Trading Markets article that documents the decline in trending behavior in the S&P 500 Index over the past 40 years. What has been eye-opening, however, is that this loss of trendiness has occurred across all time frames that I've investigated thus far. Here's an example. I took hourly readings of SPY since December 13, 2005 (N = 478). I once again looked for all occasions in which a rise was followed by a rise and a decline by a decline. If the odds of a rise or decline are 50/50, we should see half of all occasions by chance result in either two consecutive rises or two consecutive declines. In fact, we see 225 occasions where either a rise was followed by a rise or a decline followed by a decline and 253 occasions where rises were followed by declines or declines by rises. During March alone (N = 64), we've seen 28 occasions where rises were followed by rises or declines by declines and 36 occasions where there was no continuation of a move. Once again, we not only see an absence of trending--failure of rises to be followed by rises and declines by declines--but actually evidence of antipersistence. On average, rises are being followed by declines and vice versa. This is wreaking havoc with momentum traders in the ES and SPY markets. Next I'll look at other indices and sectors and see where there might be opportunity for trend and momentum traders. It's been a rough week for the small caps, as the Russell 2000 ETF (IWM) is down over 3% on a five-day basis. I went back to March, 2003 (N = 757) and looked for all occasions where the Russell was down comparably and what has happened next. In all, I found 58 occasions in which IWM was down 3% or more in a five-day period. Five days later, the S&P 500 (SPY) was up by an average .72% (36 up, 22 down) and IWM was up by an average (1.13%) 35 up, 23 down. Both are considerably stronger than the average five-day gain for SPY (.30%; 442 up, 315 down) and IWM (.50%; 445 up, 312 down). This will have me looking for upside setups today and Monday. Before the open tomorrow, I will post an analysis of market expectations based on events among the secondary stocks. That should prove informative, as we have interesting five-day patterns. Here, though, I want to follow up on my post earlier today. The market provided a great example of how trade ideas developed through historical analysis are just that: trade ideas. They need to be confirmed by real time market action to become viable trades. One of the ways I'll look at a market intraday is to scan for expectable events and setups for those events. An example would be a move back to the average trading price for the current or previous day. I know, based on research, that the market will return to its average price 3/4 of the time--and more often if volume/volatility are low. Knowing this, I will then look for a setup--a real-time event--to confirm for me that this historical tendency is likely to occur. Thus, for instance, I'll see that the ES has moved to the upper end of its range, but other indices haven't. Then I'll see volume lifting offers drying up. That will trigger my trade for a move back to the day's average price. Today I was looking for a different expectable event: A boost in the NYSE TICK to 1000 or greater. Before acting on that, I needed a setup: Some real-time event to confirm for me that buyers were gaining the upper hand. Not only didn't we get the setup, we got the reverse: Bond yields after 10:30 AM CT rose and the market sold off, taking the TICK lower. At that point, our Cumulative Adjusted TICK began making daily lows and it was clear that traders were hitting bids, not taking offers. With interest rates again weighing on stocks and short-term sentiment negative--as shown by the negative TICK--the trade idea gained no validation. All of this raises an important point: Coming up with good trade ideas is simple. The difficult part is knowing whether and when to act upon them. In my own trading, I need an idea, a setup, and then a framework for managing the trade once it's on. There is much more to trading competence than coming up with good ideas--and today provided a nice demonstration of that. Keep your eyes on the Trading Markets site this weekend. I have a historical analysis scheduled for publication that examines the stock market's trending behavior over a 40 year period. It's eye opening. I'll have a very brief summary on the Trading Psychology Weblog tonight. I thought I would update some of the modeling with the semiconductor stocks (SMH), given that we're down more than 5% over the past four trading sessions. One wrinkle I'm adding to the analysis is that I'm examining outcomes across three instruments: SMH, QQQQ, and SPY. This addresses the theme I've been touching upon lately of maximizing the instrument that you trade as well as the timing of trades. SPY: Average gain = .79% (38 up, 15 down). Average four-day gain for sample overall = .24% (435 up, 318 down). QQQQ: Average gain = 1.21% (36 up, 17 down). Average four-day gain for sample overall = .31% (421 up, 332 down). SMH: Average gain = 1.80% (35 up, 18 down). Average four-day gain for sample overall = .34 (400 up, 353 down). What we can see is that there are distinctly positive outcomes four days out across all indices. When SMH is very weak over a four-day period, the next four days have been bullish on average. Of the three ETFs, SMH has milked this pattern the most, more than doubling the average gain in SPY. It thus appears that the greatest edge is not only trading to the long side over this swing period, but also trading the very instrument that has been weakest. Let's follow up on this shortly. Two Days of Strong Downside Momentum: What Next? The past two sessions, we have had broad downside momentum in the stock market, as measured by the Demand/Supply Index monitored on the Trading Psychology Weblog. I went back to March, 2003 (N = 754) and looked for similar periods in which the two-day Supply exceeded 270 (N = 15). Two days later, the market (SPY) was up by an average of .18 (10 up, 5 down), modestly stronger than the average two-day gain of .12% for the sample overall. One week (five days) later, however, the market was up by an average of only .02% (7 up, 8 down)--much weaker than the average five-day gain of .30% over the entire period (442 up, 312 down) overall. A bounce following strong downside momentum followed by subnormal performance thus seems to be the norm. The recent market has been hostage to bond/interest rate movements, however, so these may well be calling the shots in the near term. I'm also noticing a lead-lag relationship between the DAX and the S&P, with strength in the former leading large cap strength yesterday and weakness leading overnight weakness in the ES. Hope you've been able to profit from the trend/momentum and interest rate/stock relationships we've been seeing. It's been a bit tricky if you've been trading the large cap indices such as the S&P 500, because there has been a huge divergence in performance between those large caps (stronger) and the secondary issues (weaker). I noticed, for example, that the Dow Industrials (DIA) were actually up on the day, while my basket of Speculative Stocks was down by over 1.5%. That is quite a gap. Going back to January, 2003 (N = 797), I could only find eight occasions in which the Spec stocks were down by more than 1%, but the Dow was up. Three days later, the Dow was up seven of those eight occasions by an average of .91%--much stronger than the average three-day change of .10% (435 up, 362 down) for the sample overall. It appears that, when the Spec stocks have been down sharply, they--and the rest of the market--tend to rebound three days out. Interestingly, if we just look at occasions in which the Dow is up, but Spec stocks are down (N = 60), the next day the Dow is down by an average of -.13% (26 up, 34 down) and the Spec stocks are down even more. This fits with other research I have done: When Spec stocks underperform the Non-Spec issues, the next day sees some follow through in weakness. A reasonable scenario for the market, then, might be weakness tomorrow followed by a rebound. Tomorrow AM, I will post a different analysis, tracking market performance after several consecutive down days. Big Down Day: What Happens at the Open? Quick note before Tuesday's open. A reader asked me what happens at the open after the market has moved down sharply. I looked at SPY from March, 2003 to the present (N = 758) and found 106 instances in which the market was down .75% or more from open to close. The next day's open averaged a gain of .09% (72 up, 34 down)--considerably stronger than the average overnight move of .04% (415 up, 343 down). There is thus no evidence that weak markets during the day session spill over to the overnight and, in fact, we see a modest bounce more often than not in the overnight. Given the tendency of strong downside momentum markets to continue weakness in the short run, this may set up a trade of selling strength early the next day. Thanks, BTW, for the kind comments sent to me re: the recent Trading Markets article. On 3/2/06, I wrote about the possibility of changing cycles vis a vis interest rates and stocks based on recent shifts in historical patterns. Today we saw more evidence of this, as stocks moved to multi-day lows and rates moved to multi-day highs. Specifically, we are down about 1% over the last five days in SPY and up about 3.22% in the 10-year Note interest rate ($TNX). I decided to take a longer look and went back to April 2000 (N = 1480) to see what happens when we get a rise in rates of over 2.5% in a five day period. I found 251 such occasions. Ten days later, interest rates had risen further by an average of .61% (135 up, 116 down) and stocks had fallen further, by an average of -.11% (121 up, 130 down). Rates were stronger than the average change for the sample overall (-.07%; 639 up, 841 down). Stocks were weaker than the average change for the sample (-.03%; 762 up, 718 down). I then looked at the results from 2003 to the present (N = 155). Ten days after the five-day rise in rates, stocks were down by an average of -.19% (74 up, 81 down) and rates were up by 1.10% (87 up, 68 down). In short, a strong weekly rise in interest rates has been associated with further bond weakness (rate rises) and further stock weakness. We'll have to count this as one for the bears going forward. After looking at opening and closing hours, I decided to split the difference and investigate midday hours: the time in the market from the end of the first hour of trading to the start of the last hour. Going back to March, 2003 (N = 757) in the Dow Industrials, I find 78 occasions in which we had a gain of .50% or greater during the midday hours. The average change to the same day's close was .09% (46 up, 32 down), modestly stronger than the average gain of .01% (403 up, 354 down) for the sample overall. We had 89 occasions in which the midday hours lost .50% or more. I did not find a meaningful edge by the close of the same day. By the close the following day, however, the Dow averaged a gain of .11% (50 up, 39 down), stronger than the average gain of .06% (393 up, 364 down) for the sample overall. My overall impression is that intraday traders, like the protagonist in Neil Young's "The Needle and the Damage Done", are milking blood to keep from running out. While there are some historical patterns in intraday markets and over very short time frames, they are modest compared with those that we've seen over swing periods. I'm not sure that's well appreciated among active traders. After looking at the opens recently, I decided to investigate market performance following strong vs. weak closes. I went back to March, 2003 in the Dow Industrials and examined the last hour of trading and its effect upon the next day. Overall for the sample, the average daily change in the Dow was .05% (401 up, 356 down). When the last hour of trading was up by .40% or more (N = 82), the market the next day averaged a loss of -.08% (40 up, 42 down). When the last hour of trading was down by .40% or more (N = 80), the market averaged a gain of .20% (48 up, 32 down). We thus see modest evidence of reversal following weak and strong last hours of trade. As with market opens, we are seeing little evidence that strong or weak closes carry over to the next day of trading. If anything, such moves are more likely to produce retracement than continuation. When the market opened lower today, a couple of traders asked me, "How low do you think we could go?" As Ayn Rand would say, "Check your premises!" Does a down open usually lead to a down trading day? I went back to March, 2003 (N = 757) and found 42 days in which we opened down more than half a percent in SPY (as we did today). From the open to the close, the market was up 22 times, down 20, for an average gain of .18%. That is better than the average open-to-close change of .02% (403 up, 354 down) for the sample overall. When, however, the down open follows a day's trading session (previous open to close) that is weak, the average change from open to close is .32% (11 up, 10 down). When the down open follows a day's trading session that is strong, the average change from open to close is .03% (11 up, 10 down). A down open after the previous day is weak is thus not more likely to be strong, but its gains are larger than its losses. Under no circumstances, however, could I find evidence that a down open produces subnormal market performance from open to close. It pays to check those premises! Rising Gold, Rising Rates: Evidence of Changing Cycles? The past two days we've seen interest rates on the 10-year Note rise by about 2% and gold stocks ($XAU) rise by over 4%. So I decided to take a look at what happens after two-day periods in which both rates ($TNX) and gold stocks rise by 2% or more. Since March, 2003 (N = 749), we've had 32 days that meet the 2% criteria. Interestingly, four days later we see an average change in SPY of .70% (23 up, 9 down). That's quite a bit more bullish than the average four-day change for the sample of .25% (433 up, 316 down). We have to count that one for the bulls going forward. One would think that an inflationary environment (rising gold, rising interest rates) might weigh on stocks. At least in the near term since 2003, that hasn't been the case. If we started seeing that pattern emerge, it would represent a key market shift. We've had 10 instances of 2% rises in rates and gold since 2005 and 6 have resulted in positive change in SPY four days later (average change = .22%). Thus the bullish pattern really isn't manifesting itself recently. This is worth keeping an eye on, as we might be seeing market sentiment re: inflation changing before our eyes. At the time I'm writing this (7:56 AM CT), we're looking at a down open in SPY after an up day yesterday. I found 123 days since March, 2003 (N = 755) in which we were up more than .75%. When the market opened down the next day, the average change from open to close was .15% (26 up, 23 down). When the market opened up the next day, the average change from open to close was -.08% (35 up, 38 down). It thus appears that a down open does not necessarily mean that the day has a bearish cast after an up day and, in fact, may even be slightly bullish. When the market opens, I then look to see which sectors are strong and weak and conduct lead-lag analyses to further update forecasts. This is the essence of dynamic modeling, as opposed to trading fixed models. 9:54 AM (CT) Update - Notice how the semiconductor strength and then the breakout in the NYSE TICK with the buy programs in the Russell stocks preceded the S&P 500 move above its open. That made buying weakness in ES per the analysis above easier, knowing that these are strong lead relationships. I hope this opens readers' minds to different ways of looking at real time market action. This is an important blog entry; you may want to review the posting from 2/26 (Sequence Analysis) before reading what I have here. The following is an example of sequence analysis at work. Let's set the stage. After an up day on Monday which made a five-day high, we sold off on Tuesday and made a five-day low. Several of my analyses suggested a high likelihood of a down day today. In sequence analysis, you always update forecasts with the most recently available data. This morning, the market opened up by more than a quarter of a percent. The updated forecast thus asked the question: What has happened historically when a down day has been followed by an up open? Specifically, I looked at occasions in which the market was down more than .75% on the day (N = 118) since March, 2003 (N = 755) and then divided the sample in half based on the following day's open. When the next day's open is strong (as was the case today; N = 59), the average move from the open to the close has been .19% (38 up, 21 down). When the next day's open is weak (N = 59), the average move from the open to the close has been -.01% (33 up, 26 down). Looking a bit further out, when the market opens strong after the down day, the move to the *following day's* close has been .41% (36 up, 23 down). When the market opens weak after the down day, the move to the *following day's* close has been -.06% (29 up, 30 down). In short, a strong open following a weak day affects the market's short-term trajectory. This is an example of how updating forecasts with real time data can greatly aid trading. Traders need not wait for real time events to occur, however, to conduct these analyses. They can prepare for real time possibilities by conducting "what-if" scenarios with the historical data. Such sequence analysis would look at all historical occasions of market declines such as Tuesday's and then investigate what happened when the following day opened strong. This captures the difference between mechanical system traders and historical pattern traders. Mechanical traders trade a model. Historical pattern traders conduct ongoing modeling as a dynamic process. Very, very few traders understand this and appreciate its potential.